Commemorate Justify's remarkable Triple Crown win with this beautiful print by renowned sporting artist Graeme Baxter. The official Triple Crown artwork features Justify winning the 150th Belmont Stakes and joining the "ranks of the immortals" as the 13th Triple Crown champion. Not only did Justify accomplish this remarkable run in 111 days, he also broke the Derby curse of Apollo by never racing as a two year old. Conditioned by Hall of Fame and two-time winning Triple Crown trainer Bob Baffert and ridden to perfection by Hall of Fame jockey Mike Smith, Justify retired as the only undefeated Triple Crown winner. 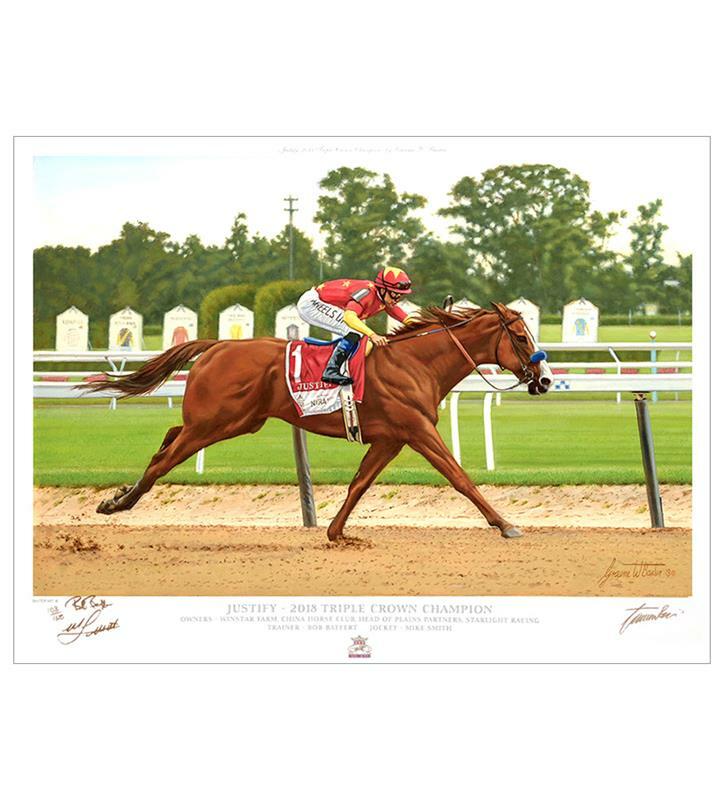 This giclee print is triple signed by the artist, jockey Mike Smith, and Bob Baffert. Limited to an edition of 150 prints. Measures 20 x 30" unframed.